Lucky fans of Atlanta Motor Speedway are going to experience the Feb. 22-24, 2019 Folds of Honor QuikTrip 500 weekend with prizes that will make it the ultimate NASCAR experience. Round 1 prize: Four green flag waiving experiences during the NASCAR Gander Outdoors qualifying session at Atlanta Motor Speedway and four Sunday morning garage tours while teams prepare for the Folds of Honor QuikTrip 500. Round 2 prize: Ultimate camping and tailgating experience for four (4) with access to a coveted camping and tailgating space along Atlanta Motor Speedway's backstretch, just feet away from the racing action. Winner: Tony Ellenburg from Black, Ala. Round 3 prize: Garage and pit lane hot passes for four (4), giving access to NASCAR garages and the pits ahead of and during the race. Winner: Jennifer Brady from Gainesville, Ga. 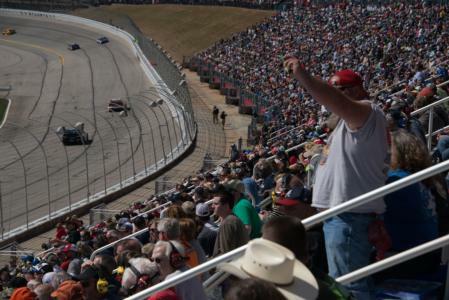 Though the last of Atlanta Motor Speedway's playoff prizes have been given away, anyone can experience the thrills of NASCAR when it returns to Atlanta Motor Speedway on Feb. 22-24, 2019. The weekend features Monster Energy NASCAR Cup Series qualifying on Friday, doubleheader action with the Rinnai 250 and Gander Outdoors Truck Series race on Saturday, and the stars of NASCAR battling in Sunday's Folds of Honor QuikTrip 500. The Folds of Honor QuikTrip 500, always a unique test of driver, car, and crew, will be the first to utilize NASCAR's new racing package, featuring aerodynamic changes and horsepower reductions designed to make the racing closer and more intense. To purchase 2019 Folds of Honor QuikTrip 500 tickets, contact Atlanta Motor Speedway at (770) 946-4211, (877) 9-AMS-TIX or visit www.atlantamotorspeedway.com.